VietNamNet Bridge - The pollution of Dong Nai River has become serious since Vedan’s factory was found discharging untreated waste water into it and Sonadezi discharged dirty water into the Ba Cheo canal. Though the two companies have fixed their problems, the pollution in Dong Nai has not been settled but it is getting more serious. Dong Nai River runs through HCMC, Binh Duong and Dong Nai. In areas adjacent to the three localities, hundreds of chimneys discharge black smoke, and the black water from the sewer system can be seen on the two banks of the river. The river sections that run through Bien Hoa City have to receive waste water from an urban area with more than one million people and from numerous industrial zones. Meanwhile, the river sections in Dinh Quan district and Bien Hoa City have to receive s big volume of waste from fish cage-farming villages. The pollution of Dong Nai River has become serious since Vedan’s factory was found discharging untreated waste water into it and Sonadezi discharged dirty water into the Ba Cheo canal. 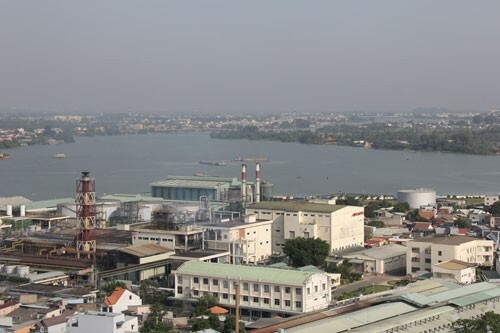 In district 9, HCMC, Di An and Tan Uyen Towns of Binh Duong province, more factories and production workshops have arisen and the waste water from the workshops all run into the Dong Nai River. Monitoring data shows that the surface water of Dong Nai is seriously polluted. The water quality of the river section that runs through Bien Hoa City is described as ‘extremely serious’ with all indicators exceeding the permitted levels. Bien Hoa residents said Dong Nai’s water is no longer safe for swimming and bathing. “The surface water looks normal, but if you have a bath in the water, you will get skin diseases,” said Hoa, a resident in Bien Hoa City. According to Hoa, the pollution of Dong Nai would be settled if the Bien Hoa 1 Industrial Zone is removed. In 2009, the Prime Minister requested Dong Nai provincial authorities to relocate Bien Hoa 1, emphasizing that this was an urgent task. Under the plan drafted by Sonadezi, the land area where the industrial zone is located would become an administration center or urban area, while the enterprises in the zone would move to Giang Dien industrial zone in Trang Bom district of Dong Nai province. The relocation plan was worth VND15 trillion. Nevertheless, there has been no considerable progress in the implementation of the plan. Explaining this, Sonadezi cited legal problems. More than half of enterprises in the industrial zone signed contracts on leasing land until 2050 and they will not move if they cannot receive appropriate compensation.